This page is an archive of the website news posted by WATAG going back to 2013. There’s plenty to interest the transport campaigner on this page! WATAG (the West Dorset Western Area Transport Action Group) are pleased to announce that they have been able to secure a service on Route 6 between Beaminster – Bridport – Bridport Hospital on Wednesday 27 December, Thursday 28 December and Friday 29 December. The service will run to the attached timetable which shows the complete service (including Dorset County Council service 40). Please note that there are some changes from the usual timetable and that the 6 will not operate north of Beaminster. On some journeys, Yeovil can be accessed from Bridport by changing at Beaminster; both operators will try to ensure that connections are maintained (between the 6 and 40) at Beaminster Square. When WATAG became aware that First Wessex intended to run a Saturday only service on 27-29 December, meaning no service on the 6 route, WATAG asked First to reconsider. They refused to do so even after we pointed out that DCC were operating their normal service 40. First were then asked if they would run the service if their costs were covered, and what those costs would be. They were willing to work on this basis and with the figures, WATAG was successful in obtaining funding from a local individual. From Sunday 15 January 2017, First Dorset will introduce changes to the 10 and X51 services. There will be amended running times on the 10 service. In the Dorchester area the bus stop on Acland Road is being removed and a new one is being introduced on Brewery Square for southbound trips only. Or you can link to info from First. The minutes of the WATAG meeting held on 22nd September 2016 are here: Minutes Meeting 93 held 22 September 2016 (pdf) for download. 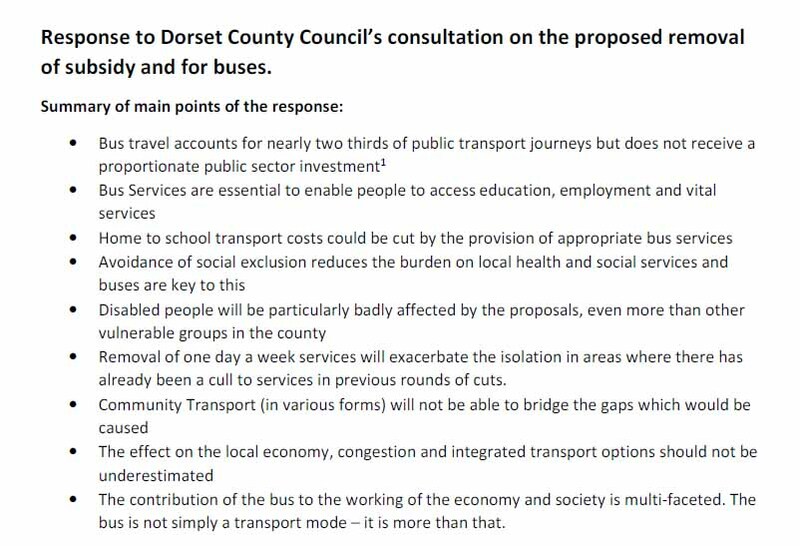 Results of the Rural Bus Services consultation by Dorset County Council: half of respondents would not use community transport intiatives. Rural isolation, and difficulty accessing shops and social activites were the most numerous respones to proposals to cut services. Dorset County Council is consulting on reducing the public transport subsidy by £1m and school transport services by £850,000 for implementation in summer 2017. Consultation ends 22nd July 2016. Dorset County Council is seeking people’s views on proposals for the future of subsidised bus services in Dorset. Minutes of the County Council Cabinet (pdf) on Wednesday, 24 February 2016, including the rural bus services review. Bus Users UK is an umbrella organisation for local groups of bus users. They have produced a final consultation report (pdf download) on Dorset CC’s consultation on further cuts to subsidised services. 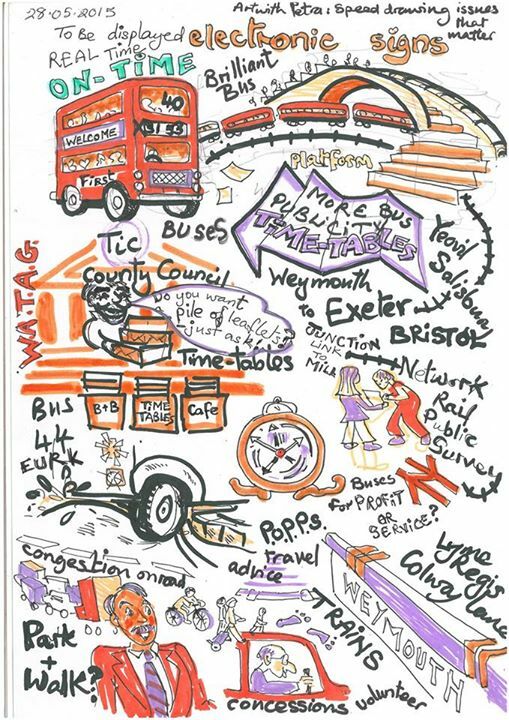 WATAG’s submission to Dorset County Council in connection with the consultation on proposed funding cuts to subsidised bus services. Ahead of the Government’s spending review, the Department for Transport has provisionally agreed to cut its spending by a massive 30%. 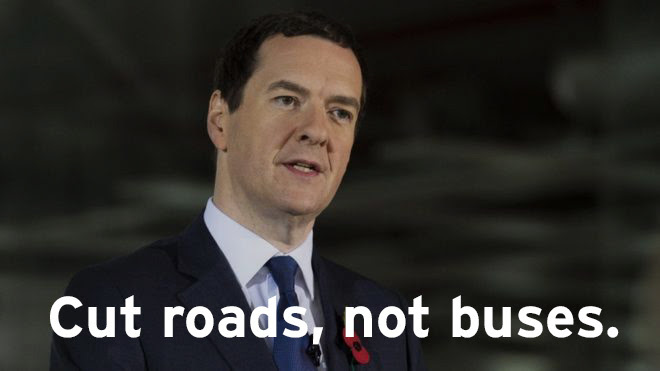 Tell the Chancellor to protect funding for everyday transport, especially the Bus Service Operators Grant. 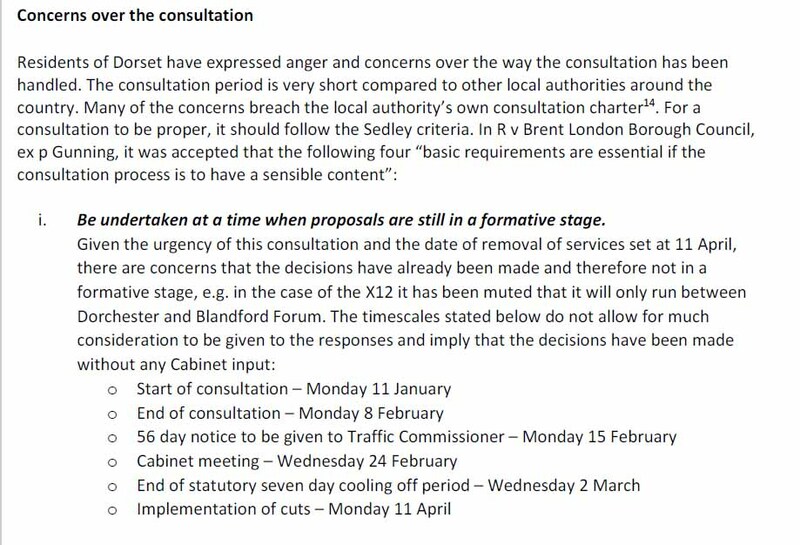 Here are the minutes from the 28th May meeting. And here is the Speed version of the minutes produced by artist Petra Hughes – useful for a quick preview or reminder of what was talked about. WATAG are pleased to announce that their PUBLIC MEETING on Thursday 28th May 2015 at Bridport WI Hall North Street Bridport will be attended by the Head of Business Projects for South West Trains, Chris Loder who will provide details of their plans in the short/ medium term. Several new routes may be opened up to allow improved access to the National Rail Network from stations in West Dorset. Some documents supplied by the Bus Action Group. Thanks go to them for their hard work. DCC minutes from meeting 12/02/2015 see Pages 16 – 21 References to quality contracts, holistic reviews and DCC leader speech. Future of the threatened with the axe – number 40 bus peak time from Bridport to Yeovil put off from 08/04/2015 to until 13/05/2015 after the district and parliamentary elections. see attached cabinet forward plan. Local Transport Plan jointly commissioned by DCC with Bournemouth and Poole – in which DCC have committed themselves to reducing dependence on the car in rural West Dorset e.g. 2.4.1. Another DCC Audit and Scrutiny committee report dated 19/03/2015 reviewing DCC’s community transport policy. 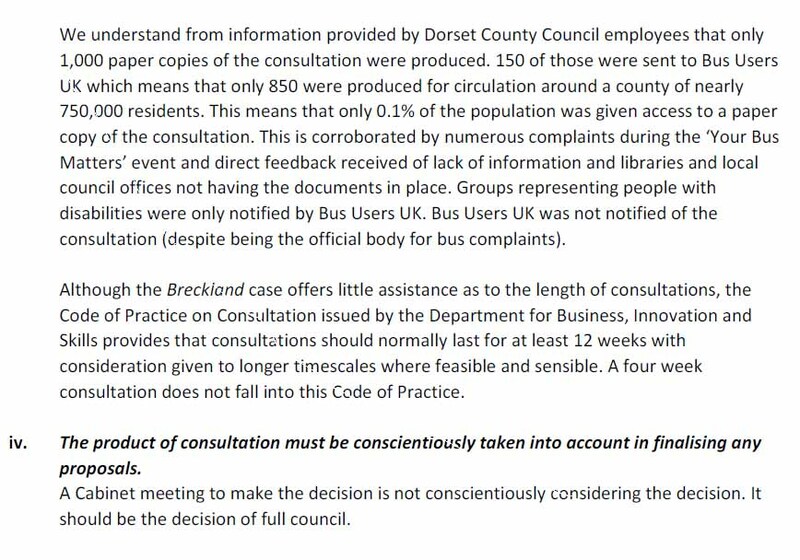 Dorset County Council Agenda Item on Motion to Council in respect of Public Bus Services – pdf download. From 28 October 2014, certain weekday exceptions to certain First Dorset services are being made for concession fares pass holders before 09.30. 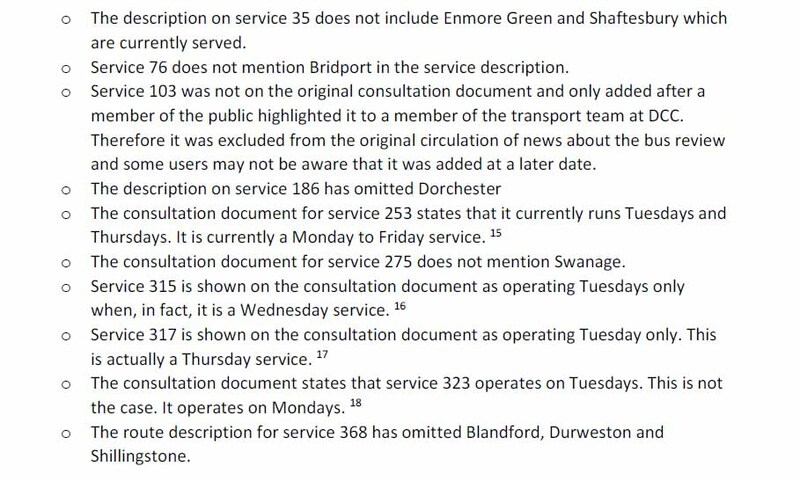 08.06 from Bridport and applies to Bridport through to Martinstown Post Office and Winterbourne Steepleton through to Martinstown Post Office for customers travelling to Dorchester. 08.24 from Weymouth to Wool through to Wareham Police Station. 06.39 from Lyme Regis to Poole for stops east of Weymouth. Consultation from DoT on guidelines for bus companies on conduct of drivers with respect to people with disabilities, people who use guide or hearing dogs etc. This is an attempt to cut down on “red tape”. Petition launched to save the 47 bus service from Bridport to Yeovil, a crucial service for students and workers. We the undersigned request Dorset and Somerset County Councils and Yeovil College to recognise the importance of the number 47 bus link between Bridport and Yeovil to students and to workers in our local economy and to commit to continuing to subsidize this important strategic route beyond April 2014 should a viable commercial alternative not be commissioned. The current timetable will be replaced 05/04/2014, by a temporary timetable until 27/06/2014 which axes the peak time (commuter services), Monday to Friday during the college holidays. Then from 28/06/2014 the service as a whole is threatened with the axe.